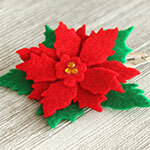 These little evergreens are cute enough to give as party favors or to use as a gift wrapping embellishment. And, of course, you may hang them on your tree! 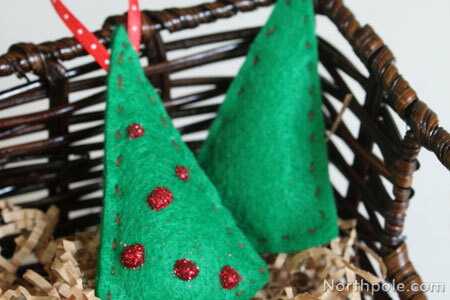 With the main materials being acrylic felt and Poly-Fil®, these ornaments are inexpensive. (Are you fresh out of Poly-Fil? 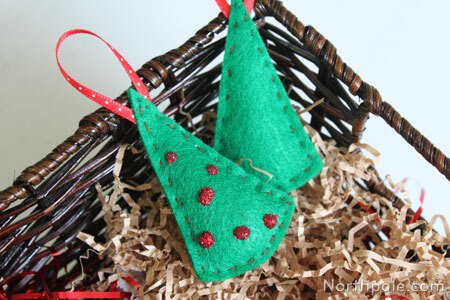 You can use scraps of felt or fabric as stuffing. Even thin plastic grocery bags work well if you are desperate; they crumple easily and make a soft stuffing.) The small size and simple silhouette of these trees make them easy to make—you could create a few of them in one sitting! Print out the�template and cut out. Pin template pieces to felt. Cut out pieces. Remove pins and template; set aside. 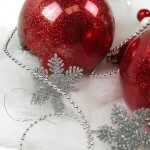 On one piece, glue a loop of ribbon near the tip of the tree (about 0.25" from the edges). Begin sewing around the tree with red thread. Sew along two sides, then stuff the tree with Poly-fil. Once stuffed, continue sewing until you reach the first stitches. 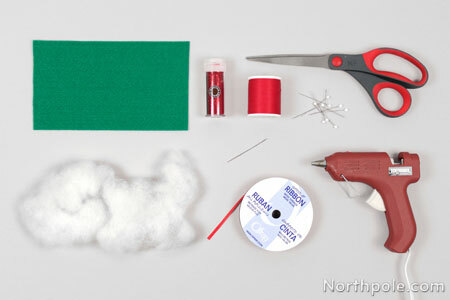 To tie off the thread and hide the knot, poke needle through one layer of felt and through the middle of felt layers along edge. For more detailed instructions on how to do this, see this article. To add “ornaments,” carefully apply a small dot of hot glue on the tree, immediately sprinkle with fine glitter. Repeat for as many as you like.